Paramount, Calif. – (April 21, 2008). 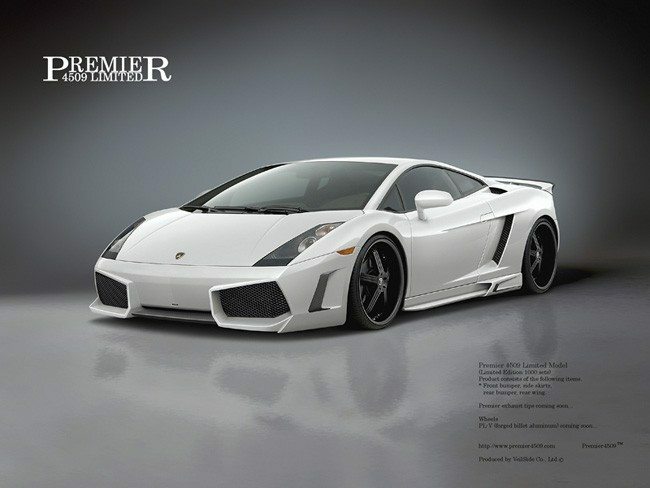 Premier4509 has added the Lamborghini Gallardo to their lineup of aero kits for exotic vehicles. The latest release from the company features aerodynamic enhancing redesigns for the front bumper, side skirts, rear bumper and rear spoiler. Optional stainless steel exhaust tips will also be offered with the package. The design of the kit will aid the aerodynamic efficiency and will direct the airflow to vent crucial components on the vehicle. “The design is reminiscent of where Lamborghini is headed in design. I wanted to capture that essence while offering a dramatic option to Gallardo owners,” said Yokomaku.